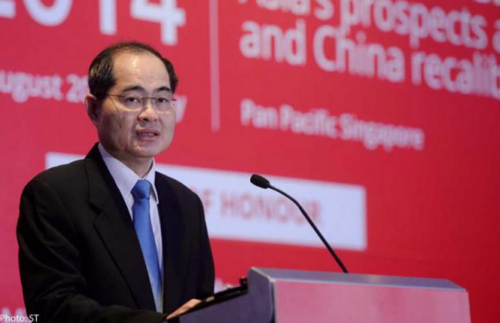 Singapore is well-placed to expand its role as a major global trading hub, said Trade and Industry Minister Lim Hng Kiang yesterday. Mr Lim, in a speech at the Global Trader Dialogue organised by IE Singapore, said the Republic is home to some of the world's largest commodity trading companies. The extensive network of buyers and sellers here creates an effective market place for global traders to structure their deals, Mr Lim said. He added that this is "the strongest reason why traders choose to be based in Singapore". Singapore is the third-largest foreign exchange market, he said, with the best US dollar liquidity in Asia, and now, the largest offshore yuan hub. He said: "As commodity trading becomes increasingly Asia-centric, global traders will be able to tap the deep liquidity available in Singapore to finance their high trade volumes, at the best prices." Apart from Singapore's sound physical infrastructure and logistical capabilities, Mr Lim also said Singapore's political and economic stability gives traders the confidence to invest in key infrastructure and capabilities. That, in turn, means Singapore, with its qualified workforce, openness to top global executives, and cultural and linguistic connections across Asia, is well positioned to further develop Asia-centric talent. As part of talent development efforts, IE Singapore, Nanyang Technological University (NTU) and five industry partners signed a memorandum of agreement yesterday to launch the International Trading Programme. The programme is expected to admit about 100 students a year, including those from fields such as engineering, business and maritime studies, to be trained in trade-related courses. Graduates will develop an understanding of the commodity value chain, especially in the context of key Asian producers and markets. NTU president Bertil Andersson said: "This partnership... will further enhance Singapore's status as a leading global trading hub by grooming a steady stream of industry-ready NTU graduates, who will be able to contribute to the continued development... of this exciting sector."